The Siebel Scholars Program was founded in 2000 to recognize the most talented students at the world’s leading graduate schools of business, computer science, bioengineering, and energy science including Carnegie Mellon University, École Polytechnique, Harvard University, Johns Hopkins University, Massachusetts Institute of Technology, Northwestern University, Politecnico di Torino, Princeton University, Stanford University, Tsinghua University, Berkeley, University of California, San Diego, University of Chicago, University of Illinois at Urbana - Champaign, University of Pennsylvania and University of Tokyo. Today over 1,000 of the world’s brightest minds are Siebel Scholars. This exceptional group has the unique opportunity to directly influence the technologies, policies, and economic and social decisions that shape the future. Siebel Scholars serve as key advisors to the Siebel Foundation, guiding the development of innovative programs the Foundation initiates. The Siebel Scholars community is also integral to a highly outcome‐driven Siebel Scholars conference held each year to explore critical social issues. All the information are available in the call for admission. The winner of Siebel Scholars 2019 is Andrea Bersano! 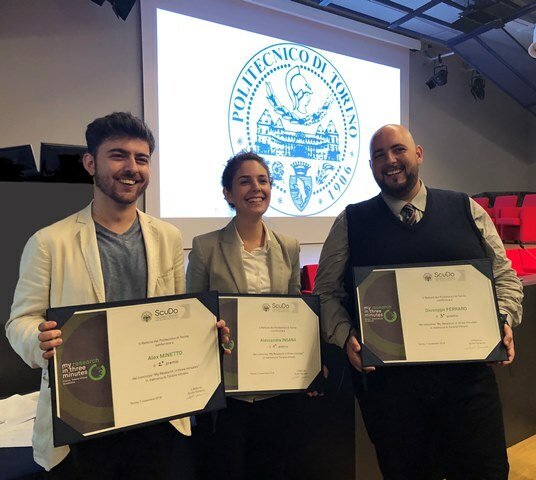 Present years of study and research in just 3 minutes: due to the success of the two past editions, Politecnico di Torino challenges again all its doctoral candidates enrolled in the 31st and 32nd cycle with the Tiziana Vitrano “My research in three minutes” – third edition award. Three minute to effectively explain the research carried out at Politecnico to a non-specialist audience. The award is dedicated to Tiziana Vitrano, who has been the Media Relations Head Officer for many years and has always worked actively for the scientific disclosure, with particular regard to young researchers. Politecnico di Torino awards three prizes for this competition: a) € 1.500 for the first classified; b) € 1.000 for the second classified; c) € 500 for the third classified. Observance of the time limit of 3 minutes and correct use of the available time. All the information are available in the call for admission. The winners are: 1st Alessandra Insana, 2nd Alex Minetto and 3rd Giuseppe Ferraro! See the video of the final competition. On 30 May 2014 the Board of Governors has established a PhD support plan which aims to value and recognize the University’s research excellence in order to increase the visibility of the Politecnico di Torino on a national as well as international scale. It also aims to increase the attractiveness of the PhD as a study course, to increase the incoming students’ quality and to stimulate their valuable activity. As part of this plan, is foreseen to grant PhD students with quality awards, in order to recognize and encourage excellence in research. The global amount to be granted is € 100,000.00 per year. The Doctoral School Board has been in charge of defining both the modalities of implementation and the conditions of the awarding process. The beneficiaries of the awards are the PhD students in their second or third year. Therefore, the 2017 budget applies only to students of 30 and 31 cycle. Here are detailed the procedure and the criteria for the assignment of Quality Awards.